//! Check this line later on. //x Delete this line later; only needed during development. //+ To Do item; an unfinished task. //- Refactor this line later on. It's become almost second nature to type //! after a line I think might need some attention, or //x after a line that needs to be removed before going to production. You can do a search for these specific comments to immediately find all lines that need to be reviewed. //- especially has made my life easier; we all know that "Premature optimization is the root of all evil", but I've always been hesitant to leave optimization until later, fearing that I would forget to do it. Now I just mark the line with the comment and forget it, knowing that I'll come back to it later. You can change the bundle to search for any specific string, such as //todo or //fixme, so you don't have to change your current practice to take advantage of this. This is just another reason why I am completely hooked on TextMate. Add this to the top of your code and you're all set. As always, you can use the GetBundle bundle to download the new version, or grab the zip file directly. Be a part of the interface. I went to the last day of the Macworld Expo yesterday, and took a whole bunch of photos. It was my first Macworld, and I was surprised at how big it was; the entire Moscone North and South buildings were totally filled. For me, the best parts were the demos that Apple was putting on. 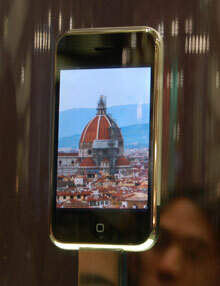 The Apple TV and OS X Leopard demos were ok, but the really good one was on the iPhone. I saw a few of these hour-long demos (since I was at the Expo for most of the day), and it was interesting to see some of the problems that the guys giving the demo were having. At the last demo of the day, the iPhone just flat refused to turn on. After taking it backstage for 20 minutes, we saw a boot screen (looks just like recent iPod's boot screen) and finally got the hands-on demo. A few other problem areas came up over the day: merging calls, fetching email from the server, web pages becoming partially transparent when scrolling (while zoomed in), and lots of accidental clicks (some of the UI elements look a little too small to be targeted with a finger). They have six months to iron out the kinks, so I'm not too worried. It just goes to show how good Steve Jobs is at giving the keynotes. His demos went so flawlessly that you'd never know it was a prerelease version. Yahoo Implements OpenID; Massive Win For The Project This is fantastic news. In the article it says that this instantly triples the number of OpenIDs out there. Float-less CSS layout It seems like I'm finding a lot of good articles that I don't 100% agree with this morning. This page describes how to use table-layout:fixed instead of float to create a column-based layout. From Gzip to JSMin to Shrinksafe to YUI Compressor The Zimbra folks talk about the different JS minifiers that they've tried, and why they now use the YUI Compressor. Understanding Web Design I'd like to think that this article will be remembered years from now as the beginning of some sort of turning point in how web pages are appreciated. Do Canonical Web Designs Exist? What are the great designs of the web? Can they be compared to great works of graphic design, such as the IBM logo? Yahoo In China: An Unfair Attack "Ultimately, Yahoo has been made a scapegoat for the flaws of US foreign policy". 26 posts have been marked with 49 tags.